How do you get people to join your program? Check out our three Recruiting Scenarios (PDF, 229 KB). You’ll learn ideas for your own recruiting. Recruiting is a great way to connect with community members and your networks. It is also a great way to explore new networks and opportunities to reach people who might join your program. It is your time to be visible and let your heart health program shine! As you probably know, recruiting involves more than hanging up a few flyers about your program. While this is important, think about many ways to attract people to your program. The biggest thing that affects your recruitment success is offering something about heart health that people want. If you are not sure what that is, see Decide Who to Reach for help. Allow several weeks for recruitment. This is especially important if your program will last many weeks or months. Below are tips to help you stay organized when recruiting. Following them will lead to successful recruitment. They can help you know what to do the next time that you recruit. Develop your timeline as you go. To start, your timeline may have only a few planned recruitment activities, but as you “get out there” it will fill up quickly. Make sure everyone on your team follows the timeline and keeps it updated. Plan for team check-ins where everyone can share what has happened, what will happen, and what is working. This is also a time to re-think ideas that have not worked. The Association of Black Cardiologists (ABC). Located out of Washington DC, the ABC does heart health training across the country. To recruit, they asked CHWs and other contacts in the cities where they would do their training to help promote the program. Since most of their contacts already had an established network, this made for efficient recruiting. Big Bend Area Health Education Center. This organization serves 14 counties in northwest Florida. The senior citizens whom they recruit for the program would have a hard time attending if not for Big Bend’s partnership with local community centers. Since the community centers regularly bus in the senior citizens for meals and community time, Big Bend offers their heart health program at the community center before or after these activities. Centro San Vicente in El Paso, Texas. Their CHWs would hand out information about their heart health program at health fairs and in the lobby of their clinic. They mainly recruited people, though, through referrals from their doctors. For example, if the doctors had patients with high cholesterols or diabetes, they would refer the patients to the program. Personal contact is important in recruitment. It is a time to meet people and put a face on your program. You can also answer their questions. Be sure to have flyers ready. Also, think about what to say about your program so people can see how it benefits them. Use the handout Stakeholders and Messages (PDF, 184 KB) for help. Talk about what you will teach in your program. Pick out a few specific examples from the manual and describe them. Show pictures of past groups. Provide details about when you will meet, the schedule, and logistics (e.g., how to get to the session, child care information, and transportation options). Hand out a flyer that has your program details. Even after people have been recruited, be sure to remind them about your program before it starts. You might want to call them both one week and the day before the program starts. Contacting people a week in advance lets you know if anyone needs to drop out and gives you enough time to recruit more people if needed. Think about keeping a waiting list if you think people may drop out. Use both traditional and social media to recruit people for your program. Traditional media includes flyers, posters, and brochures. It also includes sharing information about your program on your website and in email, or going on the local radio to talk about your program. Use social media, including Facebook, blogs, and Twitter, to announce and talk about your program and to have conversations about heart health topics. Gateway Community Health Center in Laredo, Texas, used traditional media to their benefit. They partnered with a local radio station to help promote their program. Make it clear to people what they will get out of going to your program. All the outreach and promotion you do should share the same basic message. Include information about program logistics (when, where, cost, how to sign-up) as well as any perks your program may have, such as free child care, gift cards, give-away items, or help with transportation. Be heart smart! Learn healthy recipes, exercise ideas, and ways to stay heart disease free. Everyone who graduates gets a $40 gift card! Want to be healthier? Wondering how to live heart healthy? 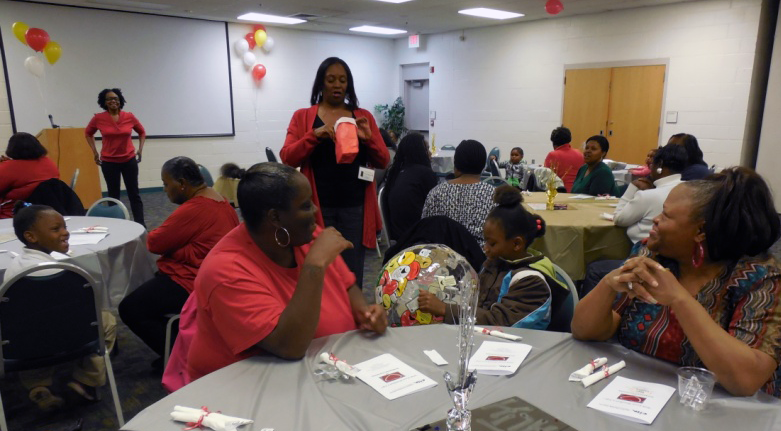 Join us for learning, activities, and group fun at our heart health program. Come find helpful solutions in a fun environment. Join us for heart health program.